You are mortified as you try not to run all the way to the bathroom! Your denture moved again during a luncheon with your girlfriends and you are hoping no one noticed. Why does this always seem to happen when you’re out with friends? There has to be a better way! The good news is there is a solution, and implant retained dentures in Fort Worth can improve the fit of your denture and prevent movement and slippage. Here’s how they work. Believe it or not, a few strategically placed dental implants can solve your problem by providing the foundation for a secure and stable fit. Your dentist will place the implants and create a prosthetic designed to “snap” into the implants. Your current denture can even be modified to work with dental implants. This not only creates a secure fit that eliminates movement, it also helps to keep your bone healthy and stimulated, which provides better longevity for your denture. 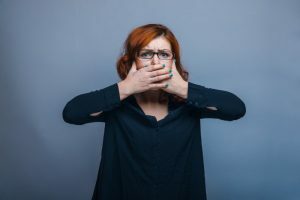 Your current denture relies on suction to your jawbone to stay in place, and as you know, this sometimes fails and causes your denture to slip at inopportune moments. This suction against your bone is also causing it to resorb, or dissolve, which also affects the fit of your denture and is the reason it has to be relined periodically. An implant-retained denture actually stimulates your bone because the implants are acting like the roots of your teeth. This protects the bone from resorption, and keeps your denture fitting properly much longer. If you’d like to know if implant retained dentures would work for your needs, your dentist can give you a thorough examination and take some x-rays. Implants do require enough healthy bone structure for proper support, and your dentist can discuss your options with you for using implants to improve the fit of your dentures in Fort Worth. Don’t be embarrassed about your dentures any longer! Call your dentist today to find out more about implant-retained dentures. Dr. John G. Boyd has been providing high quality dental care to patients in Fort Worth, TX for over 25 years. He takes care of patients of all ages and can help you determine if implant retained dentures are right for your needs. Would you like to contact Dr. Boyd? He can be reached through our website, or you can call him at 817-402-2114.